A file with the PAT file extension is most likely a Pattern Image file used by graphics programs for creating a pattern or texture across an image using a small and usually square picture. If the file you have isn't a Pattern Image file it might be in some other format even though it uses the same PAT file extension. For example, it could be a DiskStation Manager Installation file, Gravis UltraSound GF1 Patch file, 3D Patch file or Kega Fusion Cheats file. Before trying to open your file, double-check that you aren't confusing it with a file format that uses a similarly spelled file extension. You can read more about those kinds of files at the bottom of this page. 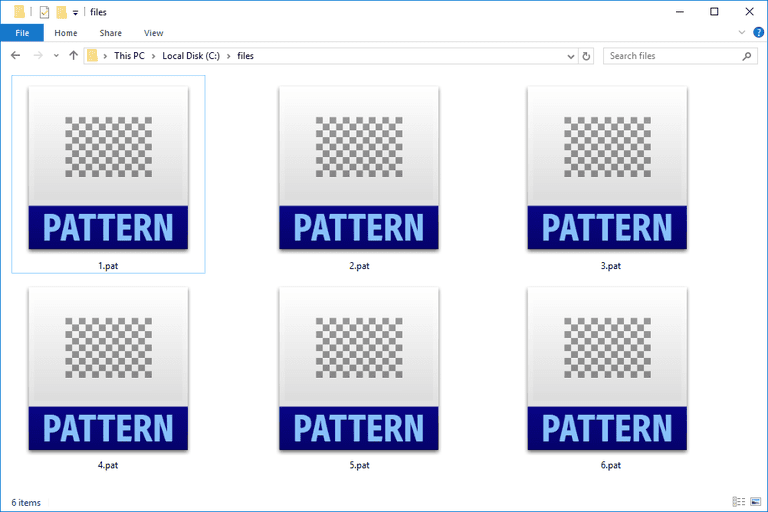 PAT files that are Pattern Image files can be opened with Adobe Photoshop, GIMP, Corel PaintShop, and probably some other popular photo and graphics tools as well. If double-clicking or double-tapping doesn't open a PAT file in Photoshop, open the Edit > Presets > Preset Manager... menu item. Choose Patterns as the Preset Type and then click or tap Load... to select the PAT file. A PAT file might instead be used as an AutoCAD Hatch Pattern file, CorelDRAW Pattern file or Ketron Sound Pattern file. These kinds of pattern files can be opened using Auotdesk AutoCAD, CorelDRAW Graphics Suite, and Ketron Software, respectively. DiskStation Manager Installation files are used with Synology Assistant. PAT files that are Gravis UltraSound GF1 Patch files can be played using FMJ-Software's Awave Studio. 3D Patch files use the .PAT file extension too. These are usually just text files that describe 3D patterns, which means while Autodesk AutoCAD and AeroHydro's SurfaceWorks can open them, so might a free text editor. The game emulator Kega Fusion is what's used to open Kega Fusion Cheats files that are in the PAT (patch) file format. If you find that an application on your PC does try to open the PAT file but it's the wrong application or if you would rather have another installed program open PAT files, change the default program in Windows. Pattern Image files used by Photoshop and other image editors are usually just small photos that those programs repeat over a canvas to create a pattern. There isn't really a good reason to convert one to a different file format. However, since they are image files that open in graphics programs like the ones mentioned above, you could just open the PAT file and make a small pattern, and then save it as a JPG, BMP, PNG, etc. An actual file converter called reaConverter can convert PAT files to JPG, PNG, GIF, PRC, TGA, PDF and lots of other formats. The program is only free during a short trial period, so you can only convert a few files before you must pay for the software. CAD software, CorelDRAW, and Ketron Software may be able to convert PAT files that are used in those programs. If applicable, the option to save the PAT file as another format might be in the File > Save As or File > Export menu. Some file formats use a file extension that looks an awful lot like ".PAT" but that doesn't mean that the two formats are related at all. Similarly spelled file extensions or even file extensions that are identical (like seen above) does not necessarily mean that the formats are related or can be opened with the same software. Some examples include PPT and PST files, both of which share similar letters to the .PAT extension but aren't actually related to the format. PST files are Outlook Personal Information Store files that open with Microsoft Outlook.